The Garmin Swim Watch lets you track your laps, stroke count pace and more. A swimming watch designed for pool use. Wirelessly upload your performance to Garmin Connect for online analysis, archiving and sharing with your friends. Use this data to spot weaknesses and improve your training sessions. Included is SWOLF scoring to help gauge how efficient your strokes are. 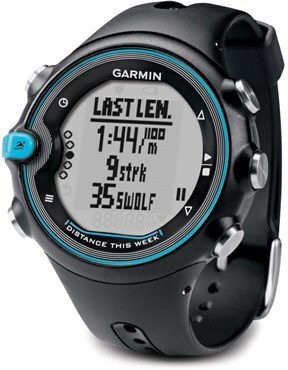 The Garmin Swim Watch offers advanced features for timed sets and logging drills. Water resistant up to 50 metres is more than enough protection for a pool environment. Garmin Swim is ready to go right out of the box – just tell it the size of the pool you're swimming in and begin your workout. Its sleek profile allows it to cut right through the water, so it won't slow you down. And you can easily replace the battery yourself whenever needed (about once a year) so you're always ready to go. With Garmin Swim on your wrist, you can focus on your technique instead of what lap you're on. 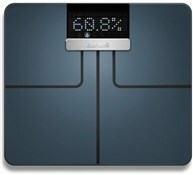 It automatically knows the stroke you're using and tracks your lengths, strokes, distance, pace and more. With a few button presses, you can also log drills or start timed sets without constantly monitoring the pool clock. It even calculates your SWOLF score to help you gauge your swimming efficiency, making it ideal for lap swimmers of all levels. The intuitive interface utilizes 6 exterior buttons, so each and every function can be accessed quickly and easily. After your workout, upload your swim data to Garmin Connect, our website for free online analysis. Here, you can view your detailed metrics and track your progress over time. You can also share your workout data with your coaches, workout buddies, or friends and family. Through the magic of ANT+™ wireless technology and the USB stick that comes with your Garmin Swim, your workout data automatically transfers to your computer when in range. Garmin Connect is Mac® and Windows® compatible.